This beautiful and distinct mushroom will be treated as "Rozites caperata" in many older field guides, but DNA studies (see below) have determined that it is actually a Cortinarius. The species can be recognized by its colors; the pasted-Kleenex texture of its young cap surface; its thick, white ring; and its rusty brown spore print. Cortinarius caperatus is often given the common name "Gypsy Mushroom," for reasons I cannot discover. The species was originally named in Europe, but when I conjure up memories of European gypsies I have seen in Portugal and Greece, no immediate parallels come to mind. Maybe I am just missing something . . .
"Fries was not far wrong," wrote Alexander Smith in 1949, "when he placed Rozites caperata in Cortinarius" (468). Since so many Friesian divisions have been mutilated by phylogenetic analysis, it is nice that Fries's Cortinarius caperatus is once again the correct name for this mushroom--after going through one (human) generation as Pholiota caperata and another generation as Rozites caperata. 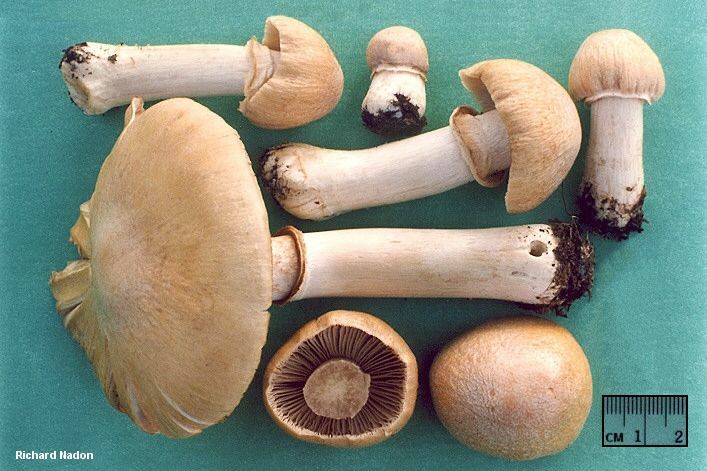 A 2002 study by Peintner and others vindicated the old Swede (for once), finding Rozites, Cuphocybe, and Rapacia to be synonymous with Cortinarius. A subsequent publication made the taxonomic transfers. Ecology: Mycorrhizal with conifers, hardwoods, and bushes in the blueberry family; growing alone or, more often, gregariously; summer and fall; widely distributed in northern and eastern North America. Cap: 5-15 cm; convex, becoming broadly convex, flat, or somewhat bell-shaped; dry; usually wrinkled; when young with a grayish to whitish, Kleenex-like coating of fibers, especially over the center; pale yellowish at first, but soon yellowish brown, often with a pale margin. 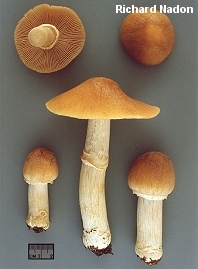 Gills: Attached to the stem; close; pale at first, becoming brown or cinnamon brown; the faces sometimes somewhat mottled or striped; covered by a white partial veil when young. Stem: 5-13 cm long; 1-2.5 cm thick at the apex; equal or slightly swollen at the base; dry; usually rough or shaggy near the apex; whitish or pale tan; with a thick white ring at the midsection; sometimes with a whitish covering near the base. Flesh: Whitish, grayish, or pale lilac. Microscopic Features: Spores 10-15 x 7-10 µ; ellipsoid or nearly amygdaliform; moderately verrucose. Cheilo- and pleurocystidia absent. Pileipellis a cutis. REFERENCES: (Persoon, 1796) Fries, 1838. (Fries, 1821; Saccardo, 1887; Kauffman, 1918; Smith, 1949; Smith, Smith & Weber, 1979; Weber & Smith, 1985; Arora, 1986; Phillips, 1991/2005; Lincoff, 1992; Barron, 1999; Breitenbach & Kränzlin, 2000; Peintner et al., 2002a; Peintner et al., 2002c; Roody, 2003; McNeil, 2006; Kuo, 2007; Trudell & Ammirati, 2009.) Herb. Kuo 10010418, 09150716.